Buzzing around the RTLS and Healthcare industry like we do, we often hear people use the words Radio Frequency Identification (RFID) and Real-Time Locating Systems (RTLS) interchangeably. If you’re one of them, don’t panic; it has been a common misperception throughout the years. While RFID and RTLS solutions are both classified as location-based services, the two are not the same. So, what are RFID and RTLS technologies exactly and how do they differ? RFID is defined as the wireless use of electromagnetic fields to transfer data.1 Signal transmission occurs between two or more communication devices (i.e. a reader and a tag) to locate objects or people. There are two types of RFID technologies to consider, active and passive. Passive RFID technology works only in proximity to specialized RFID readers, providing a ‘point-in-time’ location. Think of a retail environment here where the reader sends a radio signal to a tagged item of clothing and an alarm is triggered only when the tag is sensed in very close proximity to the designated choke point. With active-RFID, you have tags that send out the signal to a reader every few seconds (similar to a cell phone and a tower) and triangulation software or other methods are used to calculate the tagged object’s position. RTLS on the other hand, is any solution that is used to automatically identify and track the location of an asset, individual or other objects in real time. RTLS solutions consist of various tags and badges, platforms (Wi-Fi, Infrared, Ultrasound, Radio Frequency, and others), network appliances (readers and exciters), as well as other components like servers, middleware and end-user software. In 1998, “RTLS” emerged as a term to define and differentiate a new technology that often leveraged the automatic identification capabilities of RFID.2 One of the major differences is that RTLS had the added the ability to track and monitor real-time movement on a computer application. Depending on the technology platform chosen, the system locates the tags within varying degrees of granularity. The various locating architectures of RTLS include: legacy infrared (IR), Second Generation Infrared (Gen2IR™), Ultrasound, Low Frequency RF, Bluetooth (BLE), Wi-Fi, Radio Frequency Identification (RFID), ZigBee, and Ultra Wideband (UWB). Some of these technologies deliver an “estimated” location, which relies on a triangulation of sensor readings to identify an object’s location within a reasonable proximity. For example, with active-RFID, it can sometimes be difficult to determine if an object is on one side of a wall or another as RF signals have the ability to penetrate floors and walls. Legacy IR technology requires a clear line of sight for the tags and sensors to communicate so if a badge is covered by a blanket or flipped around, the system may not function properly. Ultrasound, as a communications protocol, is slower (with longer wavelengths) than infrared, so it is generally unable to match the performance of other technologies. Although Wi-Fi infrastructure is often pre-existing in healthcare facilities, accuracy is limited to as much as thirty feet, making its value as a location-tracking tool uncertain. The RTLS infrastructure that can deliver clinical-grade locating is a “multi-mode” solution that captures the strengths of complementary technologies and eliminates the individual solution weaknesses that create gaps in service reliability. CenTrak specifically combines Gen2IR, a patented technology that does not face the same line of sight constraints as legacy IR, active-RFID, and Wi-Fi in order to deliver the levels of precision and flexibility that are unachievable by any single technology. 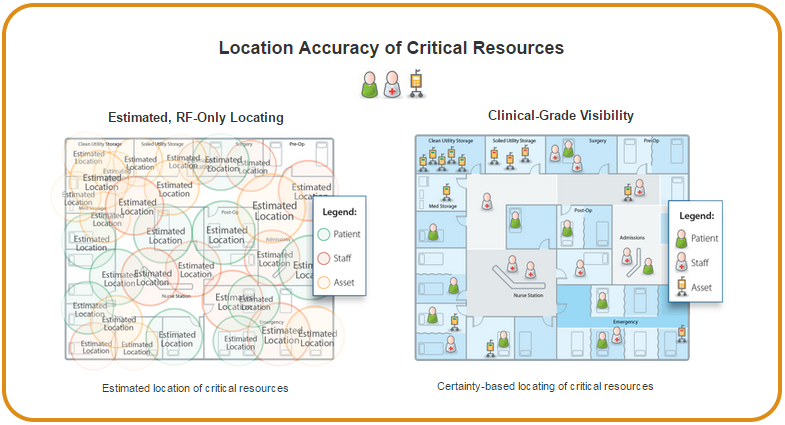 This RTLS solution provides the “certainty-based” location accuracy, reliability, speed, and safety required to generate clinically meaningful visibility and awareness.3 In this case, not only is location known, but key measures of performance can be tracked, processes can be streamlined, and predictive tools can be employed. Download our RTLS Visibility handbook to learn more!